Emma Bates ran her first 26.2-mile race last December at the California International Marathon. She won it in 2 hours, 28 minutes and 19 seconds. The house Emma Bates shares with fiance Kameron Ulmer and their two dogs sits on a remote 10 acres bordering a national forest. 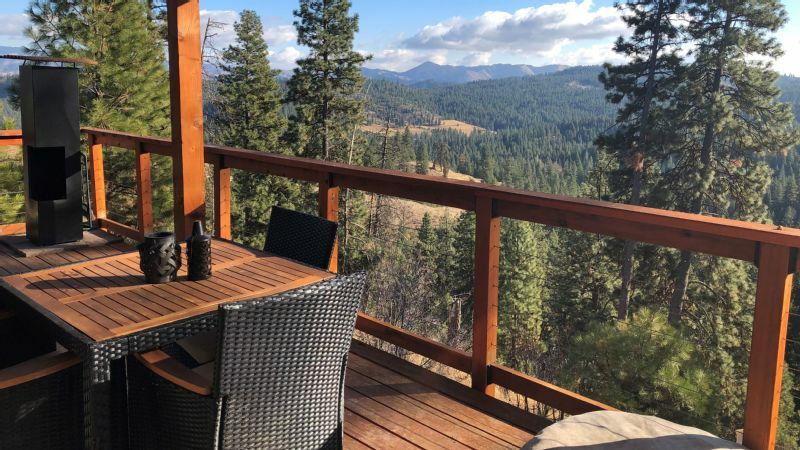 About an hour's drive north of Boise, Idaho, and at an elevation of more than 5,000 feet, the 800-square-foot retreat is engulfed by breathtaking scenery. The couple has seen wolf, mountain lion and bear tracks. Living here means sacrificing some creature comforts in exchange for solitude and natural beauty. The house is not wired for electricity, but powered by four large solar panels and has battery-operated lights. Enough electricity is generated to run a computer, kitchen stove and a pellet stove, which provides heat. Previously used only as a summer cabin and perched on an aboveground foundation, the house has yet to be properly skirted to prevent pipes from freezing. That means no running water. 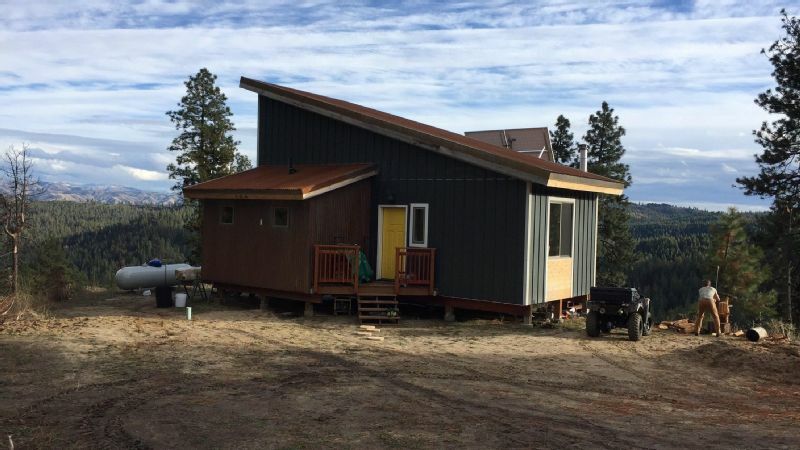 The couple transported water from a nearby spring during warmer months and now purchases it during almost-daily trips to Boise, where they shower at a gym in addition to solar showering at home. They have a manually operated sewer system that requires pouring water into it before use. "Sometimes, it's just quicker to go outside," Bates says. There is no cell phone service either, only Wi-Fi calling. The couple has no television. "Living up there, it's just so calming and quiet," says Bates, a 2015 Boise State graduate who moved back to the area from Boston at the beginning of 2018. "It's such a great escape from the hustle and bustle of the city and provides so much energy and motivation. It's perfect because I'm such an introvert. We love living this simple life." Since leaving Boston for a remote home in Idaho, Emma Bates has felt more at ease. That love have manifested itself in a reinvigorated running career that had stalled after the 12-time All-American and NCAA 10,000-meter champion graduated in 2015. Over the last year, Bates has established herself as one of America's top road racers and a contender to qualify for the 2020 Olympic marathon. The 26-year-old Bates concluded a stellar 2018 year of road racing by winning the Dec. 2 California International Marathon in Sacramento in 2 hours, 28 minutes and 19 seconds in her debut at the distance. Only seven American women have run their first marathon faster and only seven ran better marathon times in 2018. Bates was also the youngest American woman to run under 2:30 last year. "Emma's win was the culmination of a long process of getting mentally and physically prepared to race a marathon," said Ulmer, a 2:21 marathoner who also ran for Boise State. "About a month out, she was telling everybody she was going to win. Emma went into the race confident and believing in herself. I knew she was ready." Ulmer and Bates developed a strategy, but decided to abandon it just prior to the race. "We had agreed she should run the first half in about an hour and 15 minutes before trying to run the second half faster," Ulmer said of the race, which also served as the United States Marathon Championships. 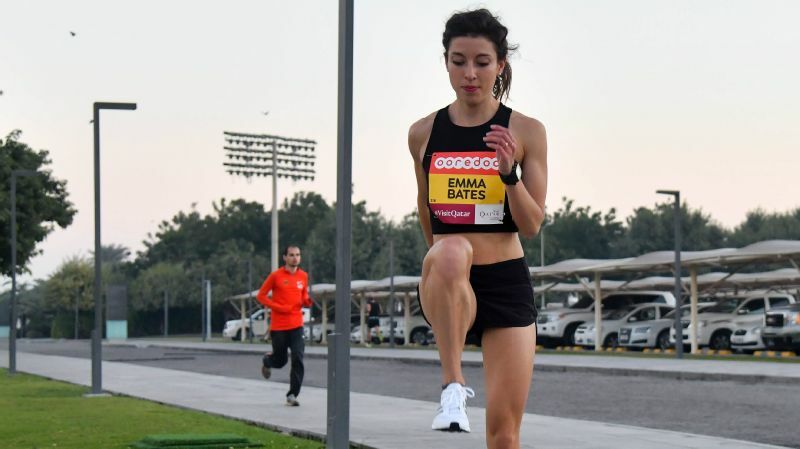 "Before we boarded the bus to the starting line, I told Emma to just run using her instincts, something she is very good at, and not worry about splits." Bates' instincts told her to take off. She led by 20 seconds at the 10-kilometer mark before stretching her advantage to 83 seconds at the halfway point, which she reached in 1:13:24. Bates' lead grew to 90 seconds before she slowed slightly. Bates stormed down the final straightaway, crossing the line 62 seconds ahead of veteran marathoner Stephanie Bruce. 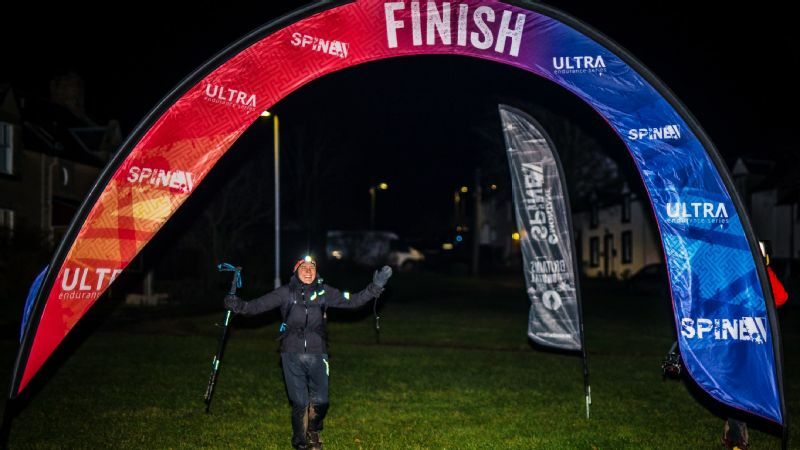 "My legs were fine, but I overdid it with fluid intake and started having trouble keeping everything down, so I eased off the 2:26 pace I was running to deal with that," she said. "It's exciting because I know I can run a faster marathon just by fixing that." Emma Bates' No. 1 goal for 2019 is to make the U.S. world championships team in the 10,000 meters. 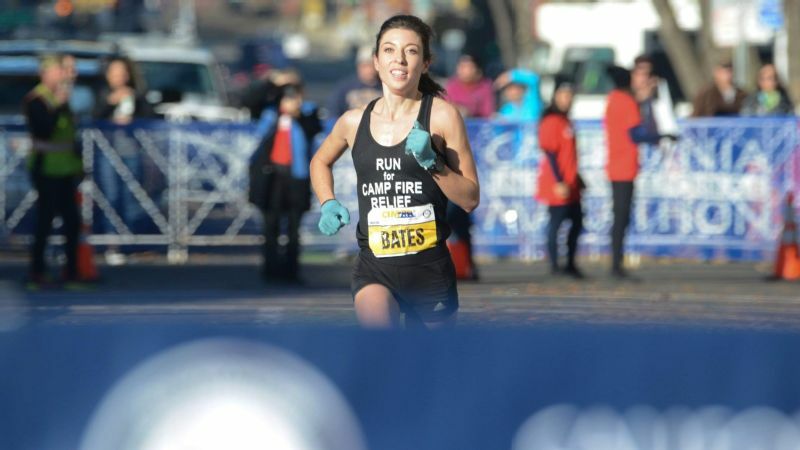 Without a sponsor at the time of the race since leaving the Boston Athletic Association's High Performance team in late 2017, Bates wore a black top inscribed with the words, "Run for Camp Fire Relief" in all capital letters to help raise awareness and funds for victims of the deadliest wildfire in California's history. "Seeing all the devastation the fire caused really affected me," she said. "I wanted to do something to help the victims and keep the story from fading away." Bates' year also included a second-place finish at the U.S. 25-kilometer championships and third at both the national 20K and 10-mile championships. She finished no worse than ninth in any race other than the World Half Marathon Championship, where Bates was the top American, placing 27th in a personal-best 1:11:45. She was also USA Track and Field Running Circuit champion, which consists of 10 road races with the top-10 finishers earning points. Despite competing in only five of those events, Bates finished with 96.5 points, nearly 30 more than second-place Sara Hall. "It's just been about being happy with my life again and getting into a training program I really believe in," said Bates, who won nearly $55,000 competing in road races last year. "Kameron has been an amazing coach, bringing me along gradually to peak for the marathon." Bates also credits new training partner Kinsey Middleton, a University of Idaho All-American who made her 26.2-mile debut Oct. 21, finishing seventh in the Toronto Marathon in 2:32:09. "We are so close in ability and the same age and train very well together," she said. "We both have the same passion for running on Boise's trails and bike paths. We have really helped each other improve and just clicked after deciding to take a couple of runs together last spring." Bates and Middleton also formed a training group in Boise with Ulmer as coach. Bates' former Boise State teammate, All-American steeplechaser Marisa Howard, all-conference distance runners Samantha Diaz (Nevada) and Kristen Findley (Vanderbilt) and former Stanford runner Megan Lacy are among the others who joined. The group soon became a USA Track and Field sanctioned club -- The Idaho Distance Project -- and has grown to 18 athletes. Bates put an exclamation point on 2018 by leading IDP to third place at the U.S. Club Cross Country Championships in Spokane, Washington, just six days after the California International Marathon. She finished eighth in the 6K event in 19:56, only 22 seconds slower than her college best, followed closely by Howard. "I had planned to run the club championships, but had no idea what shape my body would be in so soon after a marathon," she said. "It wasn't easy, but I wanted to be there for the team and dug deep. I feel like we've put the club on the map, and Kam and I are super excited about taking it to the next level. We've heard from plenty of people about joining since the club championships." Bates trains most mornings with the club before beginning her job in Boise as a nanny. Most days, Bates runs again in late afternoon. Introvert Emma Bates finds energy and motivation all around her secluded Idaho home. When the snow finally melts around her home, she will train on nearby trails and dirt roads while taking precautions. "I have not seen a mountain lion or wolf, but have seen tracks and people trap bear around here too, so pepper spray is a must," said Bates, who runs trails with one of her dogs, a Samoyed. As an energetic child growing up in Elk River, Minnesota, Bates' parents suggested track and field might be good outlet. She was a sprinter/hurdler before discovering a passion for distance running after joining the cross country team in seventh grade. "I fell in love with it immediately," Bates said. "I thought this is something I could be really good at and started working hard to get the most out of my talent." It's perfect because I'm such an introvert. We love living this simple life. The highlight of Bates' college career was winning the 2014 NCAA 10,000-meter championship in 32:32.35, which remains the third-fastest winning time in the meet's history. She also placed second at the 2013 NCAA cross country championships and third in 2014. Bates was initially excited about signing a professional contract with BAA High Performance after graduating from Boise State, but that never materialized. She was 21st in the 10,000 at the 2016 Olympic trials, running more than two minutes slower than her personal best. Bates reached her breaking point at the USA Track & Field Distance Classic in May 2017, six months after losing her father, Joseph, to a rare lung disease at age 56. Bates finished 16th in the 5,000 meters, 40 seconds off her best time. "I was already questioning whether I was really living life to the fullest after Dad died, and then I broke down after that race, just started bawling," she said. "I was not enjoying life in Boston, not enjoying running like I once did and did not fully believe in the training program I was a part of." Bates decided to move back to the Boise area with Ulmer following a heartfelt conversation with then-BAA coach Terrence Mahon. "I am very thankful to Coach Mahon for being so understanding," she said. "He said that if I felt being in Boston was not working for me and I needed to make changes in my life, I should do that." In January, Bates again became a sponsored athlete, signing a multi-year sponsorship deal with Asics. She will be wearing the company's apparel and footwear and receiving money for training and living expenses. Later this month, Bates will leave the solitude of her wilderness retreat for a much different environment -- the New York City Half Marathon on March 17. The loaded field includes world record holder Joyciline Jepkosgei of Kenya (1:04:52) and defending champion Buze Diriba of Ethiopia. Elite Kenyans Mary Wacera and Edna Kiplagat are also entered. Top Americans include Kellyn Taylor, reigning Boston Marathon champion Desiree Linden, Allie Kieffer and Sarah Crouch. Bates' best time is the 1:11:45 she ran as the top American finisher (27th overall) at last year's World Half Marathon Championships. Bates does not plan to run another marathon until the Olympic trials in Atlanta next February. She owns the ninth-best time among those who have qualified thus far. 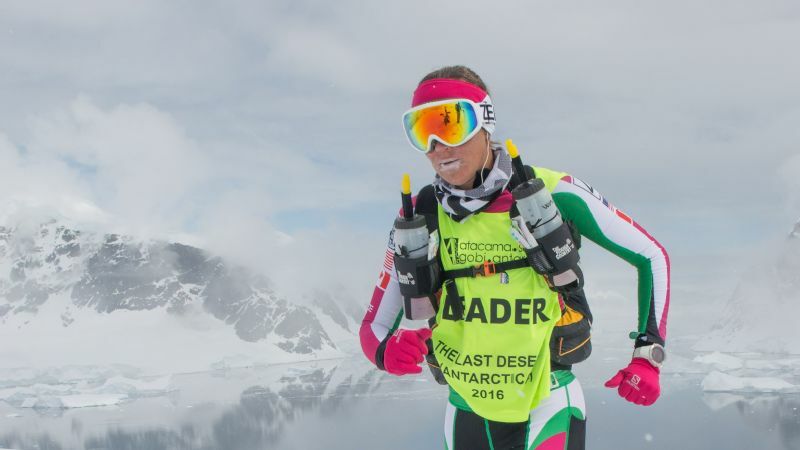 Her main goal for 2019 is making the world championships team in the 10,000 meters. To do so, Bates must finish in the top three at U.S. track and field championships in July. The world championships are Sept. 27-Oct. 6 in Doha, Qatar. "I know making the Olympic team will be very tough because of how strong the state of women's distance running is in this country," Bates said. "I'll be ready, but no matter what happens, I am enjoying the process of training and life."